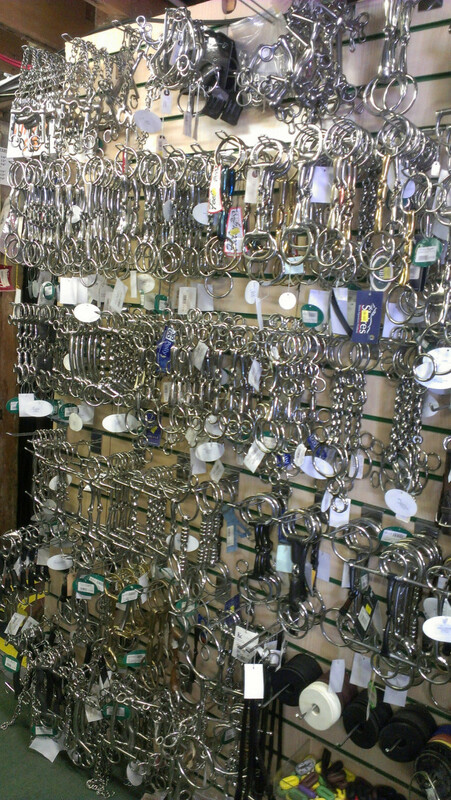 It doesn’t matter where you live, what discipline you ride or how many horses you own: we all do tack shops the same way. But nothing beats the experience of going to a real live tack shop in person. My “local” haunt is Stagecoach West, said to be the largest western store on this side of the Mississippi. I also made a pilgrimage to the famous Mary’s Tack & Feed of Del Mar back in November. From coast to coast, with two different parties shopping alongside, I noticed several facts to be true. 1. We move methodically through the store, aisle by aisle and section by section. When my mother, who is also an equestrian, and I recently rolled up to Stagecoach, we went in the door and without speaking a word both automatically turned right and worked out way along the wall. Mom had never been to Stagecoach before, and yet some unwritten code seemed to guide our movements, perhaps some barely-perceptible social cue like how an entire flock of birds seems to know exactly when to take off all at the same time. That’s all we are. A flock of tack-addicted birds. It doesn’t matter what you came in for — you will check out every aisle. Just in case. 2. We check out everything, regardless of personal choice of discipline. That includes touching every saddle, idly flipping through every rack of clothing and looking at the latest in show ring fashions for all arenas. I don’t ride English very often, but I do admire the discipline’s color-coordinated schooling outfits and the graceful curve of a Spanish-topped tall boot, and heck if I’m going to let myself stroll past a display of apparel or schooling gloves just because I don’t happen to ride English at this very moment in time. 3. We pick up every. single. bit. Like, it’s not like I don’t understand how a snaffle works by now, but seriously, try walking past the siren song of a wall of bits and NOT pick them all up and flex them back and forth. Because, you know, maybe they changed something this time. This also applies to rolling every copper roller you can find. It has to be done. Take a step back for a moment and appreciate how REALLY FREAKING WEIRD THIS IS, equestrians. The only other store where this is remotely acceptable is perhaps a grocery store to assess the ripeness of the fruit. No one walks into JC Penney’s and starts sniffing the sweaters, but equestrians in the tack shop will smell pretty much everything from the leather (okay, I understand why) to the supplements to the shampoo. I get it… I think… I don’t know. It’s still a little weird, but I’m not going to stop. 5. We never come out with only what we came in for. If you can regularly achieve this feat, you have much strong willpower than I do. I will go to the oldest defense in the book and say that all the stuff I ended up purchasing on my last tack shop trip was genuinely stuff I did need, but it wasn’t stuff I necessarily remembered that I needed until I saw it hanging on the rack or sitting on the shelf. Again, refer back to #1 above to explain this phenomenon. If I went in with a blinkered bridle and bee-lined for the one thing I actually came in for, I might possibly do okay. Embrace your tack weirdness, equestrians. And go riding!